The first time I met Ed Sheeran was a few weeks before this show. It was pretty hysterical but I was very happy to meet him and he was really sweet. 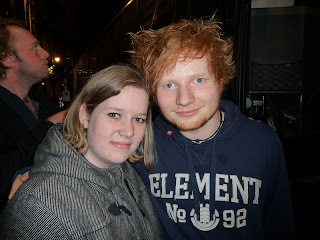 This time (march 2012) we took the first train from Amsterdam to Brussels for the show that night. We met up with some other fans there and were one of the first in line. We waited all day and saw Ed arrive too. Hey said hi quickly but he had to go in and sound check etc.The show was pretty small and intimate so it was very special and it was amazing! He's one of the best live artists out there right now. That day I also fell in love with his support act called 'Passenger'. Another amazing live artist that really blew me away that night. I'm still a huge fan of him right now (see @PassengerNL on twitter). After the show we waited for a while and in the end there weren't a lot of fans left. Ed Sheeran walked out really proudly with a Ninja Lego Ship that he had build. He put the Lego in the bus and came out to say hi. We all took some pictures and chatted with him. It was great cause everyone was calm so we had the opportunity to actually talk with him. He was so genuinely nice and took the time to listen to everyone and take the pictures. He really cares about his fans a lot. The next time we took the first train back to Amsterdam and went to the venue where he played that night straight away. Another unbelievable show. We met him again after but there were way more people so it was a bit shorter/busier etc. If you ever get the chance to see him live/meet him, do it! It's so worth it. Same for 'Passenger'/Mike Rosenberg!"